This was taken from a visit to Griffith over the past week which is now the center of attention regarding the Murray-Darling Basin Plan and water rights. 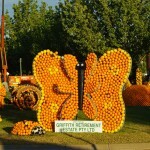 The main entry road into the town displayed some interesting ways of using oranges without eating them. I wonder how long those displays will survive before someone wants to taste.